U.S. health care costs have grown about three times as fast as gross domestic product over the past five decades, thanks to the development of technologically advanced but pricier treatments. And they'll continue to increase as the federal government begins mandating universal health coverage over the next 10 years, according to UCLA Anderson Forecast's third-quarter presentation on Sept. 15. 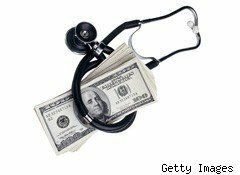 Health care spending accounted for 16% of U.S. GDP in 2008, up from 5% in 1960, said Julia Thornton Snider, economist at UCLA Anderson Forecast, at a presentation in Los Angeles. Meanwhile, annual health care spending per capita, in 2009 dollars, jumped to about $8,000 from less than $1,000 over the same time period. While an aging population, more administrative requirements and the propensity for a relatively wealthier society to put greater value on health care all factored into the long-term cost growth, the jump primarily stemmed from technological advancements. Innovations in medicine have led to procedures that had no analogues in decades past -- forms of cardiovascular surgery and treatments for premature babies, for example, which save many lives but are unquestionably expensive, Snider said. "We have 90-year-olds getting heart-valve replacements," said David Feinberg, CEO of the UCLA Hospital System, in a speech at Wednesday's presentation. "We do surgeries on people who really weren't living before." According to presenters at the event, health insurance policyholders will bear the brunt of these higher costs as the health care reform law President Obama signed in March goes effect over the course of the decade. Under the new law, about 32 million people who currently don't have health insurance will be buying it by the end of the decade, while about 15 million more people will be eligible for Medicaid, according to Thornton. "You're pushing more people into government programs that are paying below-cost coverage," said Steven Sell, president of Health Net's (HNT) Western region, in a presentation at the event. "Over time, premiums are going to move up." Those estimates are consistent with other recent studies. Earlier this week, consulting firm Aon estimated that health care costs for Americans will increase between 10.5% and 11% within the next year -- marginally more than they rose in the previous year -- because of factors such as increased prescription costs and the effects of health care reform. Meanwhile, a report earlier this month from the Kaiser Family Foundation and the Health Research & Educational Trust indicated that U.S. family health coverage costs will increase 14% this year despite a mere 3% rise insurance premium rates, due to companies raising deductibles and shifting costs to their employees. During the past five years, growth in employee contributions to insurance premiums rose twice as fast overall premiums, and at four times the rate of inflation, according to the report. Still, with the rates companies pay for health insurance also on the rise, more businesses are trimming employees' raises to cover health benefits. Health insurance benefits accounted for almost 4% of gross wages in 2008, up from less than 1% in 1960. "Benefits have replaced the opportunity for wage inflation as a percentage of total compensation," Sell said.